Though i have already baked many versions of muffins and cupcakes, my kids love to have muffins during anytime of the day. Since muffins are easy to bake and pack, i dont hesitate a second to bake a couple of these mini cakes quickly either with eggs or else as eggless. Kids wont mind whether this muffins are with eggs or not, they just want to indulge something to fill quickly their hungry tummy. 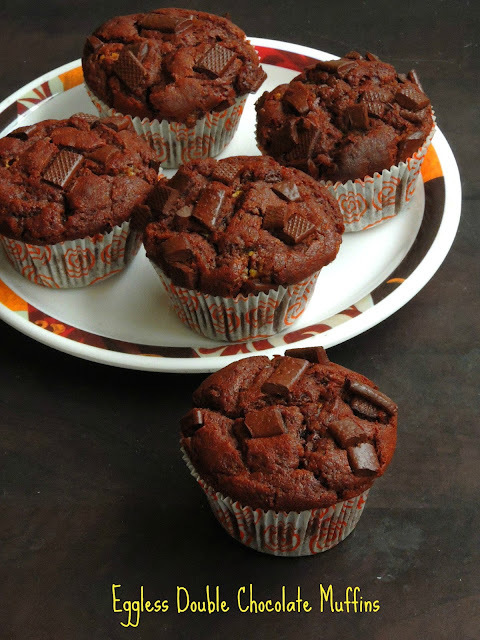 Muffins makes an excellent breakfast or brunch, served along with hot or chilled drinks one can have muffins without any fuss as this mini cakes doesnt asks for frosting. We have just a week to finish our Academic year and the summer vacation is around the corner. We have been waiting for this year's summer vacation since a long as this year's vacation is going to be something different from the previous years. Last two years, i left my family alone as i travalled to India to finish some personnal stuffs, thank god all is going smoothly now and seriously i want to spend this summer vacation with my family. Did i told you, am going to join a new job from September, yes our new academic year starts from September and my life is going to be very thrilling and busy. Dunno how am gonna manage but still am so excited to go through. OK let me stop my blabbering, as usual am running this week's blogging marathon with an interesting theme, and the theme is Holiday dishes. 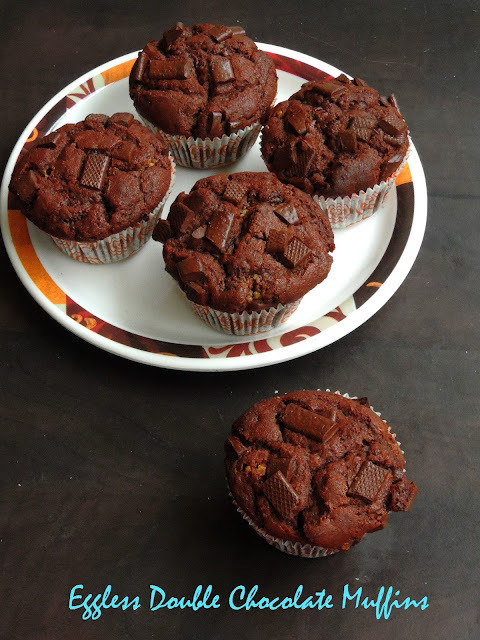 Holidays without baking, i cant even imagine and hence am starting this week's theme with this eggless double chocolate muffins which goes for simple ingredients. Trust me these dark beauties are dangerously addictive and you cant just stop with one muffin. Line muffins liners in a muffing mould or else use muffin silicon moulds. Sift the flour with baking powder, baking soda, cocoa powder and keep aside. Add the sugar and mix well. Meanwhile in a bowl, beat the yogurt, melted butter,milk,and beat everything well. Make a well in the center of the dry ingredients, pour the wet mixture and mix well. Now add the boiling water and mix gently, finally fold in the milk and dark chocolate chunks. Pour enough batter to the already prepared muffin moulds and bake for 20-25minutes until the skewers inserted comes out clean. Those muffins look too delicious. Just drooling out here. Double chocolate muffins look stunning.. They are too yummy. Such a yummy looking muffins Priya. Good luck with your new job in September and enjoy your summer with the family. Wow you got me drooling priya..got to make this again..
Congratulations on the job. I am sure you will manage wonderfully well both job and home and the blog. These muffins look yum. I want to try them. Glad thia is an eggless muffin recipe. Looks super yummy! 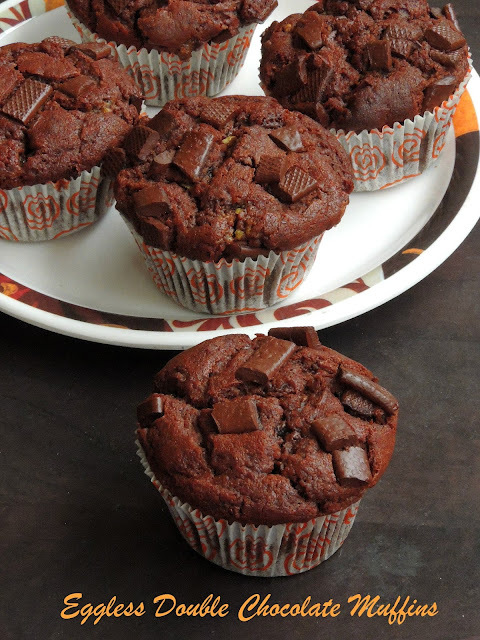 Double chocolate muffins looks fantastic dear.Good luck for the new job.